"""ONE HOUR SMART HOME - SMART PLUG""
The smart plug can be controlled from anywhere via free smart life app, you can turn on/off the electric equipment at any time no matter where you are. With the "smart life" app on your phone, you can share the connected devices with your family members. You don't need to turn on/off lights manually. ONE HOUR SMART HOME - SMART PLUG Compatible with Alexa & Google home assistant, perfectly compatible with IOS iPhone/ iPad and Android phones. Just download the ""Smart Life App"", sign up, and connect to your home Wi-Fi network with 2.4GHZ range. No hub and subscription needed. Also, it keeps your home secure. Turn on/off your connected electric appliances from anywhere and you can also customize the smart plug such as "Bedroom Lamp, Fan, Living Room Light, Humidifier, Desk Light". Control your home electronic devices from anywhere. Voice control with Amazon Alexa or google home. Save Energy, Save Money & Save Time. Easy video set up instructions on our One Hour Smart Home website. High quality and tested: We do many quality checks and test our products to make sure that they meet your standards for manufacturing with great Wi-Fi connection range. Create schedules for devices: Create custom schedules and automatically turn on/off your home appliances at a specific time. Check status on your device conveniently on the ""Smart Life App"" which allows you to add multiple appliances. 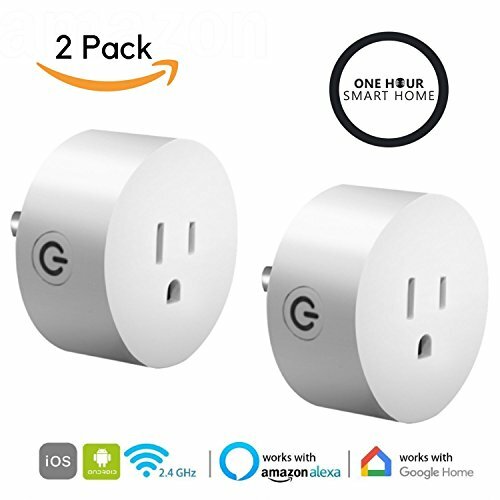 ONE HOUR SMART HOME - Smart Plug is an American Brand, based in Chicago, IL. Designed in America and manufactured in China. So, click on Add to Cart button to buy the best smart plug in the market." ✅ SMART VOICE CONTROL: The smart plug works with an Echo Dot, Amazon Echo Show, Amazon Echo Plus, Google Assistant & Google Home to manage your home devices through voice control. You can use simple voice command to turn On/Off lights and appliances which provides more convenience to your life. ✅ EASY INSTALLATION: Just download the "Smart Life App", sign up and connect to your home Wi-Fi network with 2.4GHZ range and it walks you through the easy installation. This smart plug connects to the internet through wi-fi network, no hub or subscription required. Just plug it into an outlet, connect a device to the smart plug and it wirelessly controls home appliances anytime. ✅ ENERGY SAVING: The One Hour Smart Home plug protects your device, prevents overcharging, overheating and reduces energy use. You can turn off your lights from anywhere with your phone and voice. Just say "Alexa turn off lights" and your smart plug will turn on and off the lights on your command. ✅ DESIGN: The One Hour Smart Home Wi-Fi Outlet is designed with the luxurious look with no visible seams or rough edges. Its small profile is designed to blend with the wall which suits your home. You can also customize the smart plug such as "Bedroom Lamp, Fan, Living Room Light, Humidifier, Desk Light". If you have any questions about this product by One Hour Smart Home, contact us by completing and submitting the form below. If you are looking for a specif part number, please include it with your message.